During the 1978 outbreak, members of the affected religious group traveled from the Netherlands to Canada, where cases subsequently appeared. An Amish family from an Ontario town 15 miles from the affected area moved in late summer 1978 to the Pennsylvania town where the first U.S. Amish case subsequently occurred, in January 1979. Another polio outbreak struck the area in 1992/3, most of the 71 cases amongst the unvaccinated Bible belt inhabitants. This outbreak also spread to Canada. 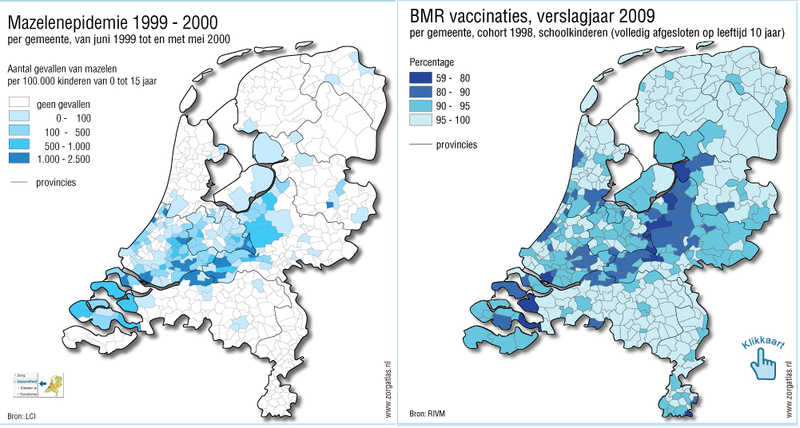 In 1999/2000, a measles epidemic struck the Bible belt and neighbouring regions, totalling just under 3300 cases, of which 94% were entirely unvaccinated, and only one patient had had both MMRs. 16% had complications, over 150 were hospitalised, and 3 patients died. Importantly No association was observed between preexisting illness and either reason for admission (P = 0.5) or residual symptoms at discharge (P = 0.5) contradicting the notion that measles are a generally "harmless" disease in "healthy" children. 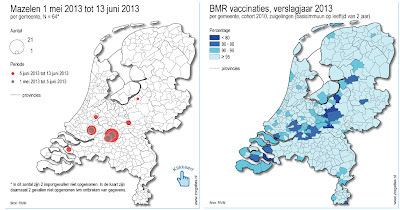 In The Netherlands and Canada, 387 and 309 rubella cases were reported, respectively. Of these, 97% were in unvaccinated individuals of orthodox protestant denomination. Reported consequences of rubella in pregnancy were 2 fetal deaths and 14 infants with congenital infection. Of the latter, 11 had clinical defects including deafness in all but eye defects in none. This is an impressive illustration how vaccine refusal (in religious and quasi-religious groupings) leads to large national and international disease outbreaks, causing significant illness, disability and death. These communities effective provide CPR to diseases that should have long been eradicated by providing a "renewable" population of susceptible individuals. Since it may not be possible to change the attitude of certain groups, it is even more important to uphold vaccination coverage around them, to reduce the potential for spread as much as possible. 13 years after catching measles from an unvaccinated pre-teen in his pediatrician's waiting room and almost 9 years after the onset of SSPE, Micha has passed away. My heart goes out to his parents, Oxana and Peter, to his three brothers and to the countless people who loved Micha and whose hearts he touched! ETA: you may leave condolences. I will not tolerate discussion in this thread. 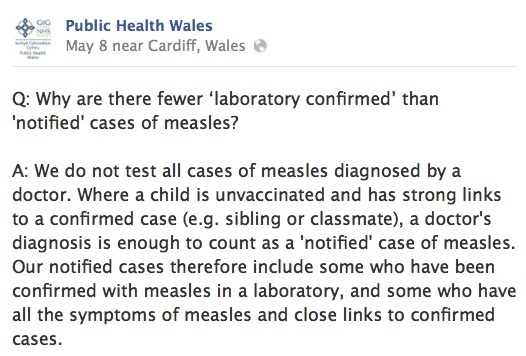 There is a measles outbreak in Wales. 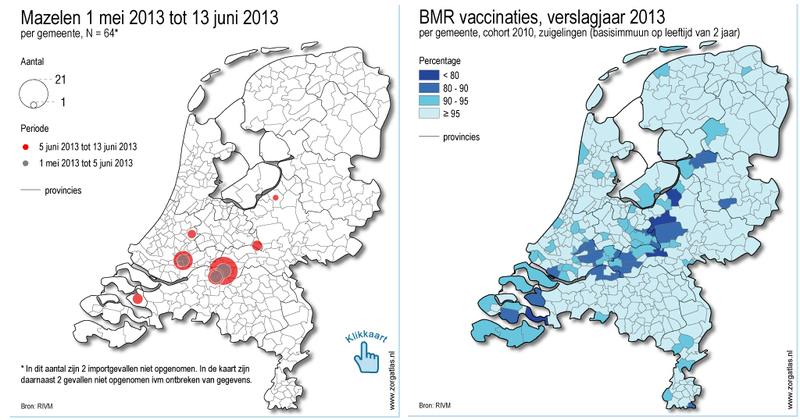 1181 cases of measles have been reported since 1 November 2012. Quite impressive for a small country (Wales has about 3 million inhabitants). 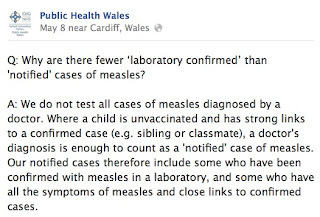 Public Health Wales have done a stellar job in reporting numbers, breaking them down into the different Welsh regions and they run a Facebook page on which you can ask questions and will get them answered. Countless weekend and in-school clinics were run to get the Welsh youth protected (a lot of teens did not get their MMRs/or MMR booster in the wake of Wakefield's manufactuversy). Despite PHW's fabulous work, the pro-disease faction have been up in arms. First of all, they abused the fact that not all cases were laboratory confirmed to claim that there is no outbreak, it is fabricated, all to cause panic to increase vaccine uptake (like good vaccination uptake was a bad thing). Never mind that laboratory confirmed cases are catching up with the reported numbers (like they should, those tests take some time to come back); that is part of the conspiracy, too (lowers voice "they noticed that numbers don't match, so they are making new numbers up" - really). many anti-vaccine posters still insist that the delayed publication of numbers was fishy (after all, GPs should know whether their patient has been vaccinated or not) and continually allege that real time reporting was somehow important for their decision. 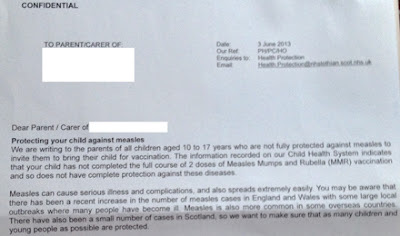 It seems that although we have been registered with the same GP for many years, and said GP should have all of our children's vaccination records, and I have in writing that they are up to date, their Child Health System has our son down as "not [having] completed the full course of 2 doses of MMR". Obviously, ascertaining vaccine coverage is not quite as trivial as some think. Thank you PHW for checking before publishing data on vaccine coverage without verification. Now if you or your child really have not had 2 MMRs - go get them now. MMR is highly effective in protecting you and your loved ones from measles.